Alchemy has always had a bad reputation, but at the same time it also has had an irresistible attraction. Many people have gotten involved in alchemy, each in their own way, with their own practice. For some it was a spiritual quest, others were looking to make gold and get rich, some made chemical discoveries, and others were philosophers. Alchemy has been, and continues to be, a stimulus for many people to seek, to wonder, to philosophize, and to learn more about what Nature has to offer us. It is a universal way of discovery and we find it in many cultures. 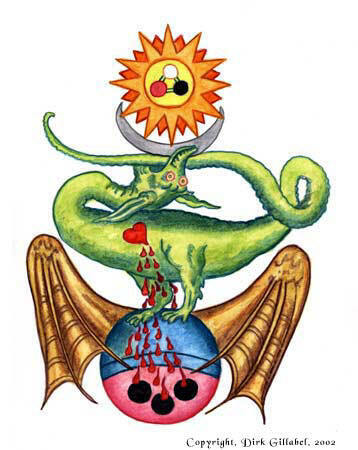 In its origins and and in its essence, alchemy is spiritual. The search for the alchemical gold is the search for wisdom, light, perfection, and enlightenment. In past times there was no separation between science and religion/spirituality, and thus we find alchemy mixed with other areas of ‘science’. In Western Europe, alchemy used many symbols from chemical science, probably to disguise their actions during times of persecution by the Catholic Church. But it also allowed them to use a language to express spiritual experiences for which there was no vocabulary. Over time many people, misunderstanding its essence, got involved in their own ‘alchemy’, only looking to make physical gold. Some were indeed charlatans and the reputation of alchemy became clouded. When reading numerous alchemical texts, one easily gets lost in the manifold symbols, contradictions, claims, processes, and so on. It is obvious that each writer, for as far as he was honest, had their own interpretation of what alchemy was, or what the symbols meant. Some alchemists made their texts intentionally confusing, so only an experienced colleague knew what the writing was about. But other writers were very clear, and with almost no obscure symbolic language wrote about their experiences. From those writings it is obvious that alchemy is about the discovery of the spiritual nature of man, of nature and of the cosmos, and especially about one’s own development. There were alchemists who used alchemical symbols for their chemical work, therefore one has to know if a text is philosophical or purely chemical. To find out read his text and see what the symbols he was using meant. Remember, however, there is a basic common language, as I have tried to explain this in this article. Keep in mind that any symbol can be approached from many sides and can have a number of interpretations. It is more important the you get a ‘sense’ of what it is all about, than it is to fixate yourself on the meanings of particular symbols. The central idea in alchemy is that matter and spirit are one whole unity. They are inseparable and one works on the other. “With the aid and help of God, she (alchemy) reveals all hidden energies of the whole wide world. As the vine grower grafts the vine to the elm and espalier, thus the magician, the alchemist, marries and unifies heaven and earth, the lower and the higher energies.” (Pic de Mirandole). The alchemist must purify himself in this material-spiritual world. Alchemy was an art that was more refined than any other art or science, because alchemical transmutation demanded more than skill and knowledge. Spiritual qualities were necessary. Only when one had attained the highest state of perfection one could make the philosopher’s stone. Therefore one must unify himself with the divine, resulting in a new ‘birth’ or new state of consciousness. Franciscus Kieser (16-17th century) explained that there is Wisdom, a light that is the breath of the divine energy. This Wisdom is a ray, a brilliance, a mirror, and is the manifestation of the divine energies. It moves everything. it rules over and emanates Nature; it is invisible and a maintaining fire, an inscrutable power of the uncreated interior. When it leaves the creations it immediately goes to the grace of God, to the Holy Spirit. This is what the true alchemists were after. It is found both outside and inside oneself.